Wednesday's attack on journalists, writers and cartoonists in a Paris office by terrorists purporting to be affiliated to Al Qaeda has shocked much of the world. The attack on what many see as a right to free expression, freedom and free speech has also rallied a call, prompting thousands to come onto the streets in protest against the Islamic extremists. One prominent symbol of defiance was the phrase "Je suis Charlie" which began to circulate on social media soon after the attacks which left 12 dead and 11 others injured. The phrase first began trending on Twitter in response to the terrorists exclamation that they had "killed Charlie Hebdo" as they left the scene. The response from ordinary citizens and others was "Non". Charlie Hebdo and the spirit of freedom, freedom of expression and free speech had not been killed. Charlie Hebdo was still alive, alive in the minds of those that proclaimed, "Je suis Charlie". French media in particular took a similar line. For example, Liberation, a centre left paper, went to press with a black front page emblazoned only with the words "Nous sommes tous Charlie" - "We are all Charlie". But while there was indeed strong sympathy and a solidarity expressed, worldwide, for those murdered as they sat in their office, few made the bold step of reproducing the cartoons which prompted the attacks. The fear of reprisal attacks has prompted most papers and online around the globe to refrain from even showing partial clips of Charlie Hebdo cartoons. Indeed we're not all Charlie as so many have claimed. Few of us, and particularly the media, are that good, and even fewer are that brave. In fact many media outlets have yielded to the terrorist demands that insist open discussion, criticism and the lampooning of Mohammed and Islam be off limits. The Associated Press has already begun the process of deleting all previously published Mohammed images [Daily Beast]. Some editorials, rather than standing in solidarity with the likes of Charlie Hebdo have in fact called their decisions "stupid". In a response to the terror attack the Financial Times' Tony Barber wrote "common sense would be useful at publications such as Charlie Hebdo, and Denmark's Jyllands-Posten, which purport to strike a blow for freedom when they provoke Muslims, but are actually just being stupid." [Reason]. Edits were later made to the piece, dropping the 'stupid' reference. Nonetheless is clear that many so called serious papers see Charlie Hebdo and other similar publications as infantile, school-boyish comics which have acted irresponsibly and have wrought what they sowed. The "Je suis Charlie" proclamations were an admirable sentiment, resonant with the classic post-9/11 Le Monde cover "Nous sommes tous Americains." But it was also totally inaccurate, argued Matt Welch on the Hit and Run blog posted on Reason.com. "Do you really wanna be Charlie Hebdo? Then get on out there, live and speak bravely. And God help you." Indeed, it is just such fear that has prevented some papers from reproducing the covers of Charlie Hebdo in their coverage of the story. Nearly every British paper has stopped short of printing the cartoons even to the extent of pixelating photographs of the offending magazine if shown in a picture of Charlie Hebdo staff. Others have instead opted for tightly cropping pictures [Daily Beast / Breitbart]. It wasn't just CNN. Despite hours of blanket coverage of the attack on Charlie Hebdo offices, there was barely a glimpse of the offending magazine on the BBC News channel, Sky News or other news channels [Mediaite / Slate / Politico / Haaretz]. There were some who made the brave decision however. The French paper L'Echo ran with a black front page with the central headline "Tous des Charlie" [All Charlie] surrounded by a border made up of Charlie Hebdo front pages, more than half featuring the controversial depiction of Mohammed. 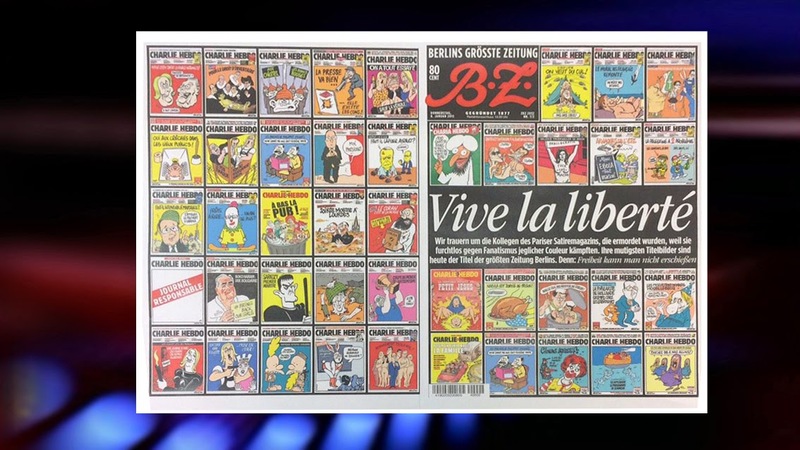 The German publication the Berlin BZ went further covering both its front and back pages with 33 Charlie Hebdo cartoons alongside the headline Vive la liberté [Long live freedom]. Some online publications ran with a retrospective of some of Charlie Hebdo's notable front pages. Amongst them were Time, Bloomberg and Mashable. Whilst news media were concerned over the publication satirical cartoons, many were not perturbed in reproducing graphic images of a French policeman being shot dead by Islamic terrorists on the streets of Paris. The images grabbed from a video and posted to YouTube showed the armed terrorists shoot the wounded police officer as he lay on the ground before they calmly made their way to a vehicle and drove off. Papers around the globe published the picture of the gunman shooting the policeman. Some pixelated the face of the officer, but others showed the photograph uncensored. The irony of the killing was that the policeman was himself a Muslim, named by authorities as 42-year-old Ahmed Merabet. Charlie Hebdo's remaining editorial staff say they will publish as normal next week in defiance of the terror threats and murder of 12 of its employees. But despite the anger and rhetoric expressed by much of the Western media, it seems fear and terrorist threats has dictated editorial decisions elsewhere.